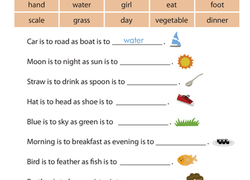 Looking for a worksheet to help you year four child with vocabulary? This printable will help him by using context clues. Use this resource with your students to practise making connections between words. As your students complete the analogies, they will identify the relationships between words and their meanings. Use this resource with your students to practise identifying relationships between words. As your students complete the analogies, they will notice synonym relationships.